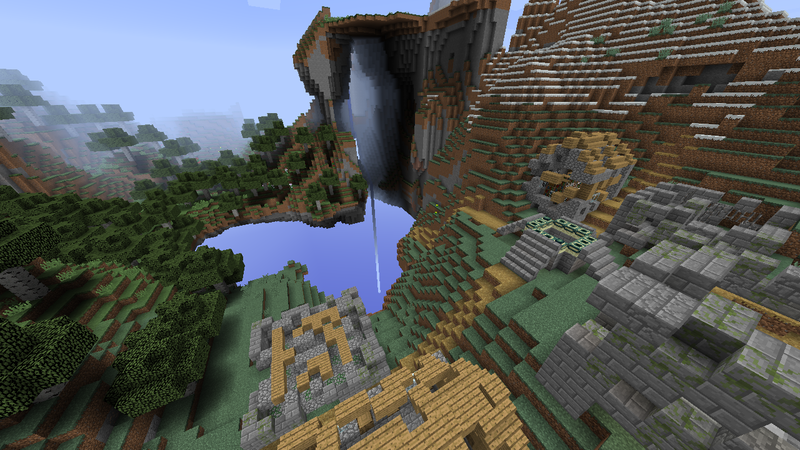 So over the history of Minecraft there have been a lot of Skylands worlds, mods, etc. I even created one and worked on it for over a year before but I stopped working on it after my other computer's hard drive failed a few months back. So I decided to start fresh. So I started with the regular Overworld (seed 7054886416251170592), then deleted everything below Y=64 (altitude 65), and then took some of the terrain and flipped it upside down using MCEdit's tools, and then put it on the underside and changed it a little to get rid of the obvious resemblance to the terrain on top. As for the ores, I decided to make it so iron occurs up to y=96, gold up to y=64, and diamonds and emeralds in the highest locations (above cloud level). Then I decided that the terrain was a little too flat and boring so I took terrain from a customized preset world with the same seed and put it in the map. 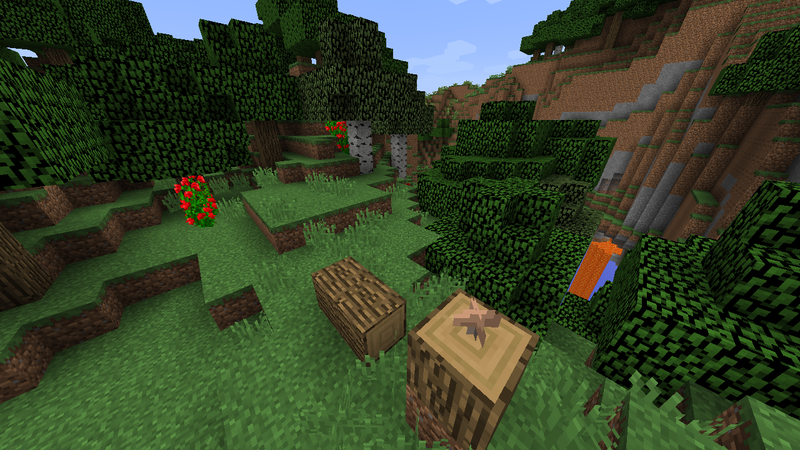 The biomes will be slightly different from the regular Minecraft world. So far I have the swamp, jungle, plains, desert, savanna, forest, and extreme hills done. Screenshots coming soon. EDIT: by the biomes being different I meant the features in them, NOT the biome map itself. 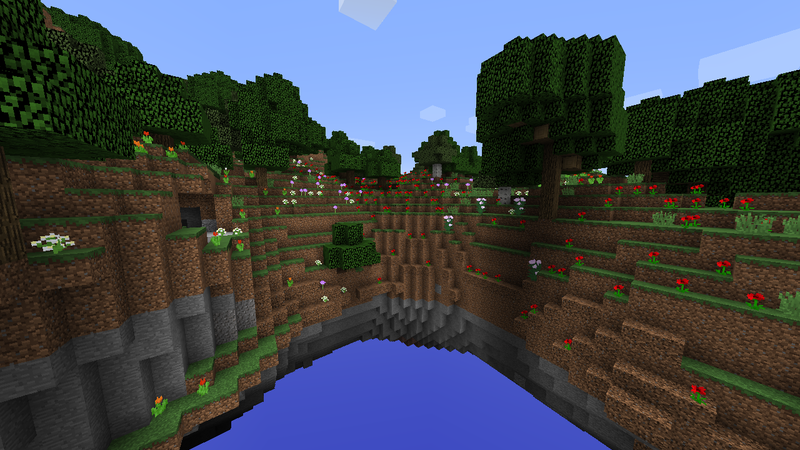 In this map, the terrain is more varied than in a regular Minecraft world. There can be large mountains in any biome except plains and swamp. The forest you spawn in is quite flat except for one rolling hill, but a couple hundred blocks west there is a mountain going up to Y: 148. There are flat forests and mountainous forests, and when you stumble upon a biome, you will not know what you will find (unless you are going to an area I have taken a screenshot of). 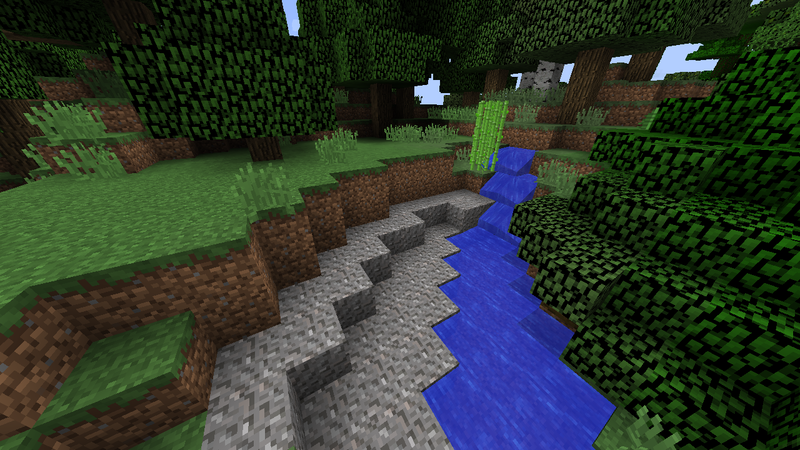 You know how Minecraft rivers are creepy and still? Not in this map! Rivers in this map change height with the terrain, and have a current in the direction that is downstream. At the edge of a floating landmass, the rivers end in waterfalls, which you should avoid if you are in a boat. I have now taken a few screenshots. I put coarse dirt on some places on the edges of the land. One of the screenshots is in the jungle, another in the flower forest, and yet another on the other side of that same forest area. Terrain is a little bland though. Soo..., I used a different customized preset for the terrain. Had to fix the Flower Forest area but that's all right. This should fix the bland terrain. 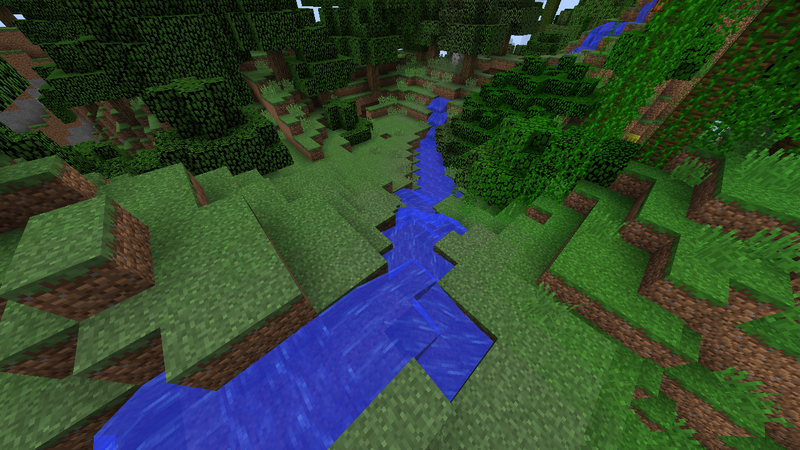 Btw, I really like the little Streams I put where the rivers were. Will post screenshots when I have them. 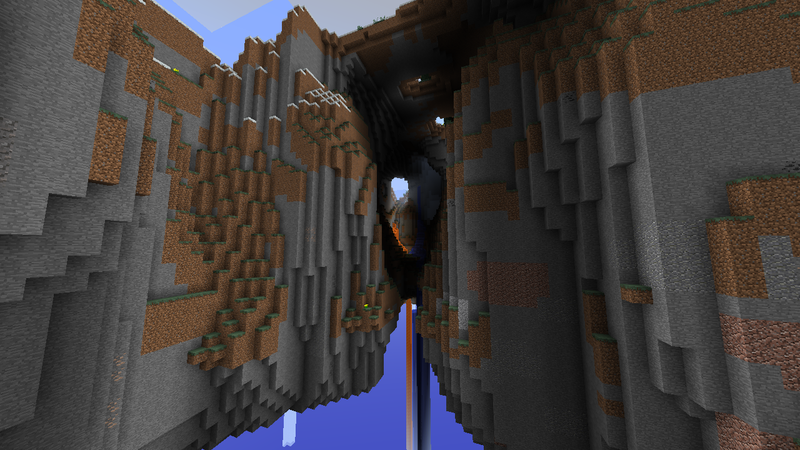 I am now working on the Extreme Hills biome in this map. 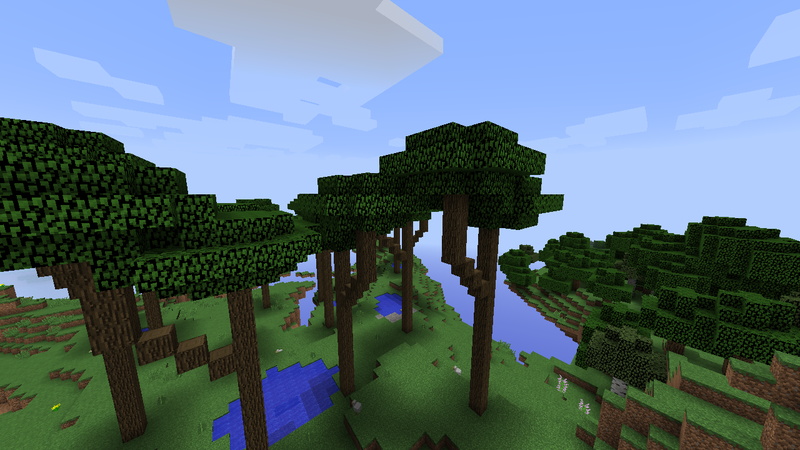 I will also add a Forest Lakes variant of the forest, as well as a variant of the taiga with bigger trees (like those biomes in BWG4 1.6.4) and melons, and also a shrubland biome between a plains or forest or any dry biome. In the end I will probably end up with something like 45 or 50 biomes. I still have the Birch Forest, Mesa, and Mushroom Island to work on. But for now, let's move on to the Structures. 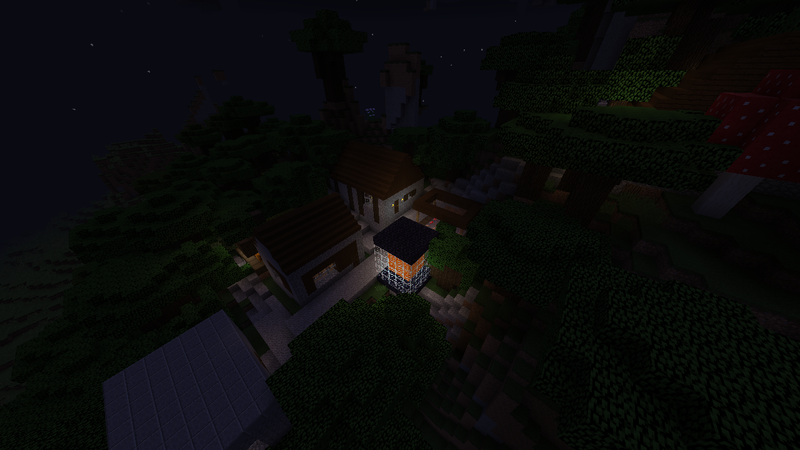 First, I decided to improve the Villages. The houses will be slightly bigger and contain fireplaces, bookshelves, carpets, and beds. There will be sugarcane and pumpkin farms. Every village will have a Church and Blacksmith. The seed for this map (7054886416251170592) does not have any woodland mansions within 3500 blocks of the origin (the world border in this map), so I will add a replacement to the Roofed Forest biomes, the Illage, which is a village only with dark oak wood items and the buildings include most of everything you would find in a Woodland Mansion, as well as one-time Illager spawns. 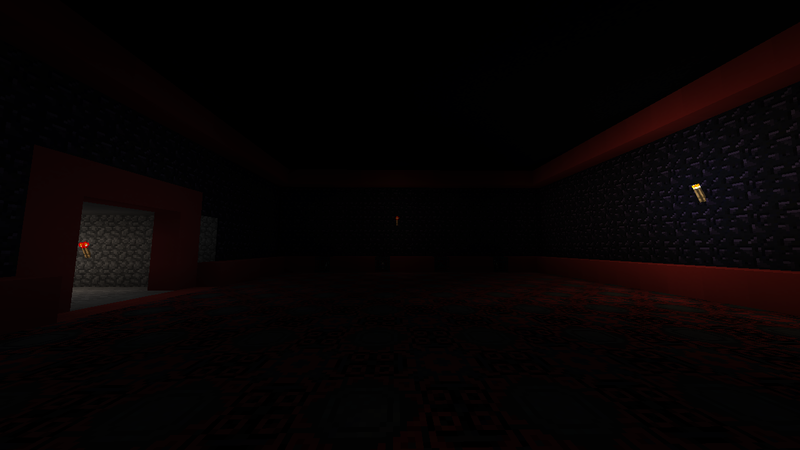 In the basement of one of the houses there will be an Evoker. 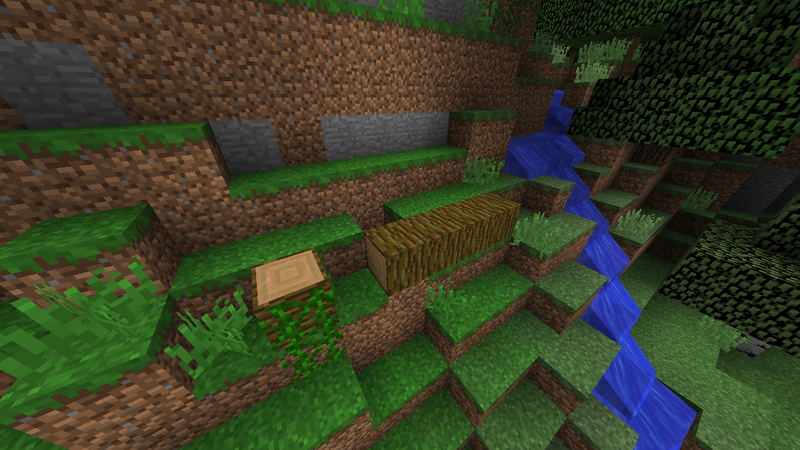 I now have an early screenshot of the Illage in the Roofed Forest biome a few hundred blocks northeast of spawn. The terrain never goes below about Y 50 so there will be no strongholds. I am thinking of adding surface ruins as a replacement. So I can now tell you more. There will be just four Ruins structures in the entire map. 3 coincide with stronghold locations in the seed, while there is another one east of the southernmost stronghold within 3500 blocks of spawn in this seed. Ruins will include everything you'd find in a stronghold, and will look like a village with (obviously) wrecked buildings. The End portal implies that whatever wrecked the Village came from the End, went back, and now the portal has fallen into disrepair. I decided to just recycle some old ideas for the floating Dungeons in this map, but one of them caused this problem with the allocated memory so I had to remake that idea. But I do have the one that looks like a big sphere of terrain done. In that one I am not sure if I want to make it obvious on first glance or let some people walk in to their doom, but if one day you download the map and are planning to go into one, please read this. In this dungeon, you will face witches, husks, cave spiders, and strays, all of which give you negative effects, so don't even think about entering the battle room until you have several buckets of milk, a good sword, and good armor. The Undersides of the landmasses need a lot of work. Caves on the above side usually have discontinuities around y=65 and the ore veins below that still mirror everything above that (mostly) and I also want to add glowstone and hanging plants. Also this morning I began to work on making the Nether skylands as well. The Swamps need a lot of work. I need to make it so that it never goes over 8 blocks above lowest ground level in the swamps. I also spent the last couple days working on the Mushroom Island, which needs a real reason to go there. At the center of the island will be a structure that I will call the Mushroom City, which is kind of like an End city, only with huge mushrooms. I also worked on the Biome Transitions, resurrecting an idea from my old project. So far I have only done the savanna/desert transition, but for the forest/plains and forest/savanna transitions, I will probably have the tree density increase going into the forest. 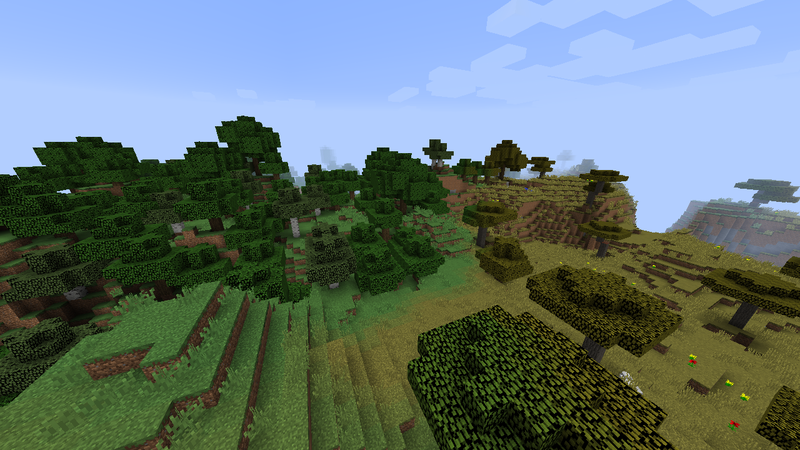 In a plains/taiga transition or forest/taiga transition there will be pine trees on the non-taiga side of the biome line. In a transition between a non-snowy biome and a snowy biome there will be snow layers staggered in the same way the sand is in the savanna/desert transition. 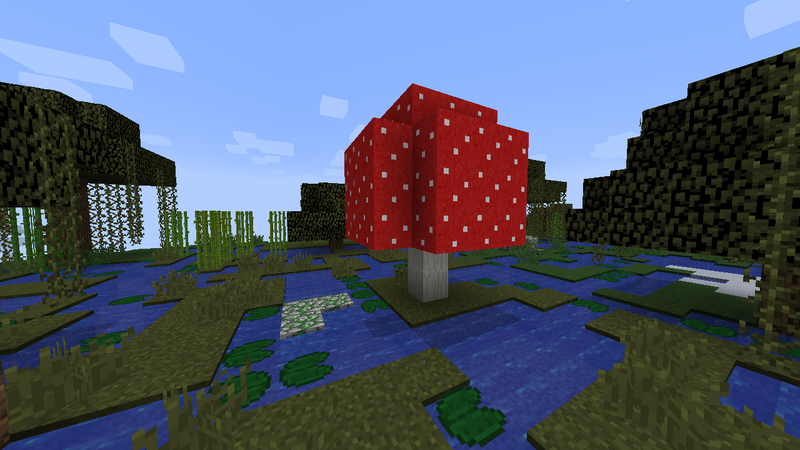 I also decided to add some of the Bedrock-exclusive stuff to the map, like fallen trees and huge mushrooms in the swamp biome. For the allocated memory problems (that you said was linked to spawners), try making AreaEffectPotion mob spawner spawner (basically an areaeffectcloud with 0 radius and infinite duration with a custom name) that trigger when the player reaches a certain radius and has a dummy objective set to a number that represent [NOT MAKING MAP]. Use periodic @e execute functions to detect players, refresh AreaEffectCloud duration, and spawn spawners/kill itself upon reaching close enough. Honestly though, I have no idea if such a solution would make performance better or worse on your system, so do some test runs. Actually, I have determined that the allocated memory thing does not have to do with floating dungeons. But when I monitor it it never exceeds about 65% so we may never now. Also, any thoughts on my work so far? I decided to add gravel beaches next to the rivers like the ones that were in Beta (which anyone who has played this game since 2010 or 2011 will remember). I am also thinking of adding the larger and smoother sand beaches but the rivers are too small and I don't know what to do with the ocean biomes. Can anyone help me on that if you see this post? I figured out the solution to my ocean problem in this map. I decided to have water that spills out into the open when the ocean biome touches a land biome, while everywhere else in the ocean biome is just nothing. Since people like the beaches from Beta <1.8 so much I decided to add them into the map. Sand beaches were easy for me to do, but the gravel beaches are a whole different beast because the rivers are constantly changing in height (BTW not everyone is sad to see the gravel beaches in the rearview mirror but I decided to include them anyway). 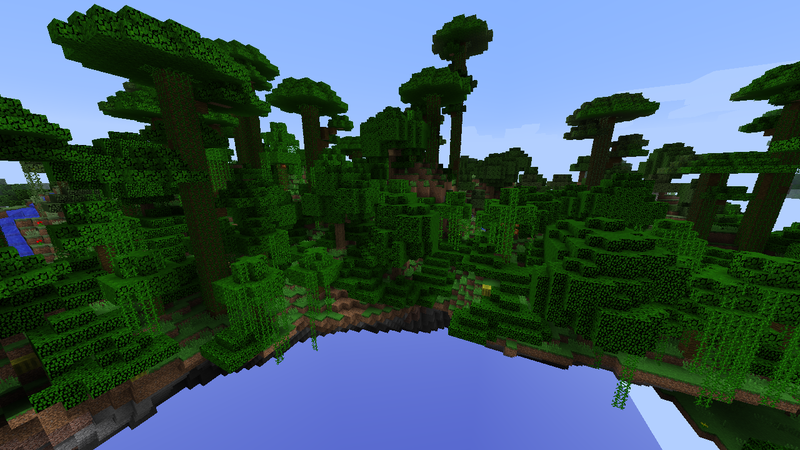 The gravel beaches will be found in the larger form near water lakes (which I need to work on anyway), like in that area of the forest near the jungle south of spawn where there are the tall trees. I decided to start working on the dungeon loot in this map yesterday and the allocated memory skyrocketed from 35% to 100% in less than a minute, like seriously? Why a simple dungeon chest would cause that much of a problem is beyond me. Anyway, I decided to include biome specific loot in the dungeons in this map, like cacti in deserts and saplings in forests depending on the types of trees found there, and slimeballs in swamp dungeons. I noticed something. The terrain in my map isn't quite Sky Dimension-like. Are there any mods I can use that have the Sky Dimension as a world type (because I don't know if MCEdit will recognize modded dimensions), that AREN'T stuck on 1.7.10? Because I have serious reservations about downgrading more than a few major updates, but at the same time want to use mods to get the terrain I want for my map. If you have used mods like BWG4 or Skylands Forge, you know what I am talking about. I am doing a complete overhaul of the terrain in my map. 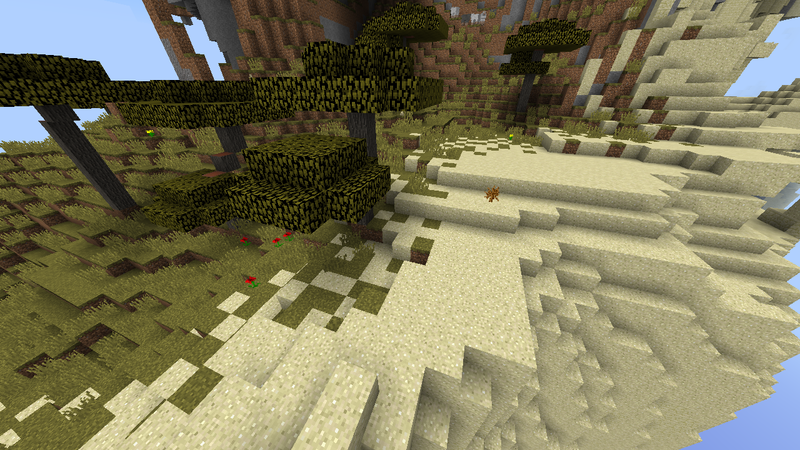 I will probably keep the current terrain in this map for a map that I will just play survival on and not release. I will see if I can re-add features like flowing rivers to the map afterwards.